English was different back then. I’m bringing “muffs the scene” back. Eerily he waits on tombstone slab. Then, with monster gestures & loud noises he prepares attack. But he muffs the scene as his pants fall down revealing gay red striped shorts. He turns bright red; changes his mind; & shuts off. 14”; batteries not incl. 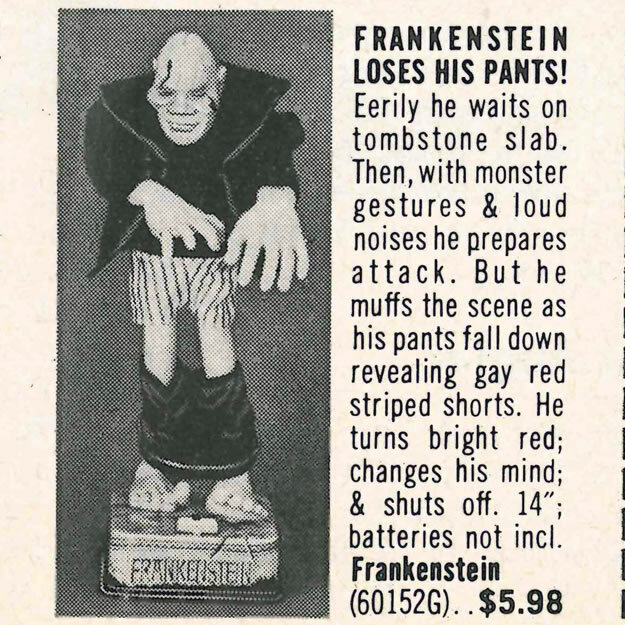 This entry was posted in ads of yore and tagged ads, advertisements, catalogs, frankenstein, magazine ads, novelties, pants, print ads, vintage ads on January 11, 2017 by Clayton Hove.